Faces of South Tampa offers the revolutionary CoolSculpting® to clients in Tampa. Only CoolSculpting® targets fat cells alone, eliminating them in an easy, non-intrusive fashion that exercise and diet can’t achieve as quickly or as effectively. You may start to see changes as quickly as three weeks after your treatment, and will experience the most dramatic results after one to three months. Your body is still flushing fat cells and will continue doing so for up to four to six months after treatment. During CoolSculpting®, the treated fat cells are eliminated. As long as you maintain a healthy lifestyle, long-term results should remain stable. The CoolSculpting® procedure has up to a 95% patient satisfaction rate. How much does the CoolSculpting® procedure cost? The price for CoolSculpting procedures varies depending on your areas of concern, the number of sessions needed, and your ultimate goals. Our CoolSculpting Specialists can create a customized treatment plan with you that is tailored to your body, your goals, and your budget. In the past, clients of Faces of South Tampa were only able to treat one side of their hips during a one hour treatment. Now both sides can be treated within one hour! DualSculptingTM uses two CoolSculpting® applicators to simultaneously treat unwanted fat in different areas of the body. We apply the patented cryolipolysis applicator to different areas, including both love handles, both thighs or both muffin tops! CoolSculpting® is a non-invasive, painless and simple procedure. The providers at Faces of South Tampa will place a gel pad and a specialized applicator to deliver cooling to the fat cells in the targeted area. 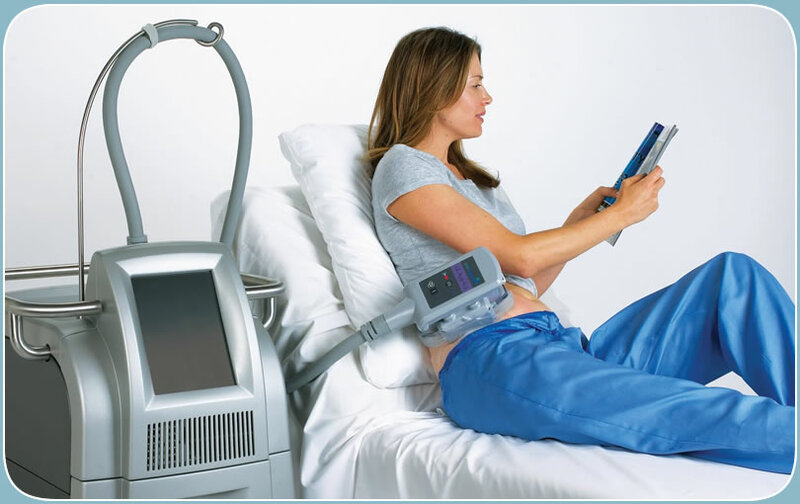 This process, called cryolipolysis, chills fat cells and stimulates the natural removal of these cells. The fat is then metabolized by your own body. After a number of weeks, the areas which have been frozen start to reduce as the fat is lost. The manner in which CoolSculpting® works specifically targets fat cells via calibrated temperatures. Contact with the cold temps causes the fat cells to crystallize. Over a period of two months, these crystallized cells die, which stimulates the immune system to send enzymes out that break down the dying fat cells so they can be easily and safely eliminated by the body. An interesting element of CoolSculpting® is that once the targeted fat cells are destroyed, they don't return. If you gain weight down the road, the excess pounds won't be deposited in the treated areas—they'll simply show up someplace else. Many clients are satisfied after one treatment. However, during your complimentary consultation at Faces, we can discuss a treatment plan that will meet your specific treatment needs. The CoolSculpting® procedure is performed by the providers of Faces of South Tampa. The technology enables precise, controlled delivery of the cooling that affects only fat cells on your body, ensuring that no surrounding tissue or cells are affected or damaged. Additionally, because CoolSculpting® is non-invasive, there is no risk of infection, complications from anesthesia, or other side effects associated with surgery. During your treatment, a gel pad and applicator are applied to the targeted area. Applicators that use vacuum will draw the tissue into the applicator cup. You may feel pulling, tugging, and mild pinching. Controlled cooling is then delivered to the targeted fat so you may feel intense cold but this sensation typically subsides within 10 minutes as the area becomes numb. Many people read, check email or even take a nap during their sessions. Afterwards, patients are usually able to return to normal activities. Does CoolSculpting® or DualSculptingTM hurt? CoolSculpting® is a gentle and entirely non-invasive procedure. It does not require any anesthesia or pain medication. Most clients experience no pain to minimal discomfort during this procedure. While having the procedure you read a book, listen to music or simply take a nap. While everything necessary will be provided for you at Faces of South Tampa, you are welcome to bring any additional comforts of home such as music, pillows or reading material. Is CoolSculpting® right for everyone? CoolSculpting® is designed for individuals who are healthy and fit, but who want to eliminate fat in areas of their body that have not responded well to diet or exercise. It is not a substitute for weight loss or liposuction, nor does it address problems with obesity. The excellent staff and providers at Faces of South Tampa can help decide if CoolSculpting® is right for you during your complimentary consultation. What areas can Faces of South Tampa treat with CoolSculpting®? At the present time (as CoolSculpting® keeps delivery new advancements) we are able to treat the flanks (love handles), hips (muffin top), upper and lower abdomen, male chest, inner thighs, outer thighs, upper arms, axillary fat pads (below the armpit), submental fat (double-chin), under the buttocks (banana roll), above the knees and back fat (bra bulge).